Let's discuss an ingredient that even Hippocrates, the father of medicine, was said to have used and prescribed: apple cider vinegar. Apple cider vinegar (also referred to as ACV) is a type of vinegar made through the fermentation of apple cider. Specifically, it's made by crushing apples to squeeze out the juice. Bacteria and yeast are then added to the juice to start the alcoholic fermentation process, which turns the sugars into alcohol. Then, in a second fermentation process, the alcohol is converted into vinegar by acetic acid-forming bacteria. Acetic acid and malic acid give vinegar its sour taste. Most of the apple cider vinegar you buy in the store is then filtered and pasteurized to give it a clean appearance and to kill off all the bacteria to give it a long shelf live -- but that's not the ACV we're interested in. Many of organic, unpasteurized apple cider vinegar's medicinal uses come from the "mother of vinegar," which is made up of living nutrients and bacteria that you can actually see in the bottom of bottles of raw apple cider vinegar. Apple cider vinegar as an all-around natural health remedy has been gaining in popularity, and when you look at the benefits, you won't be surprised. One ACV health benefit that research has suggested is helping with diabetes. It is believed that the acetic acid found in apple cider vinegar may help prevent digestion of complex carbohydrates in your food, which would help to lower blood sugar. A few studies help support this idea. But that's just the beginning. One study found that two tablespoons of apple cider vinegar before bed lowered glucose levels of study participants in the morning by four to six percent. Another study showed vinegar improves insulin sensitivity to a high-carbohydrate meal in 19% of subjects with type 2 diabetes and 34 percent with pre-diabetes. The net result is that taking apple cider vinegar with meals can lower blood sugar levels in people with diabetes. Another key health benefit of apple cider vinegar is weight loss. A 2009 study on mice showed that consuming acetic acid (the active component in ACV) upregulates the expression of genes for fatty acid oxidation enzymes in the liver, causing a suppression in body fat accumulation. In another study, a double-blind trial showed that a daily intake of apple cider vinegar might be useful in the prevention of metabolic syndrome by reducing obesity. In addition, taking vinegar seems to work as a weight loss aid by making you feel full, which in turn helps reduce the number of calories you consume. In a 2005 study, participants who consumed vinegar with a high-carb meal (a bagel and juice) consumed on average 200 to 275 less calories per day. The vinegar also helped lower glucose and insulin responses. 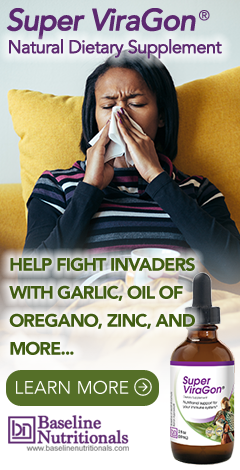 Apple cider vinegar is anathema to all kinds of germs that attack the throat. In effect, it acts like a sponge and draws out throat germs and toxins from the surrounding tissue. It also helps clear up the sinuses by breaking up and reducing mucous. Since it has antibacterial properties, it is also useful in helping with infections. These are a few of the reasons you'll find it in Jon Barron's Super ViraGon formula. Apple cider vinegar can help your skin in a number of ways. A concoction of two parts water and one part apple cider vinegar can be used as a skin toner. You can either apply it directly on a skin irritation or soak in a bath with about one cup of apple cider vinegar to help relieve many skin irritations such as sunburns, bug bites, and poison ivy exposure. It is also said to help fade age spots and acne scars, and help remove warts. Apples, apples juice, and apple cider vinegar contain natural malic acid, but of the three, apple cider vinegar has the highest concentration. This is important because studies have shown that malic acid supplementation increases urinary citrate excretion and urinary pH: both of which help in dissolving calcium oxalate stones, the most common form of kidney stones. Potassium, magnesium, and other minerals are present in the apple cider vinegar “mother.” Potassium controls the water balance in the body and maintains a healthy heart rhythm. Magnesium is a catalyst in enzyme activity, helping digestion and assisting in the uptake of calcium to form healthy bones. The “mother” is also a rich source of iron, beneficial phytochemicals, and it is high in prebiotics that promote the growth of beneficial bacteria in the gut. ACV stimulates a condition called acetolysis in which toxic wastes that are harmful to the body are broken down and rendered harmless. Mixing one teaspoon of apple cider vinegar with water and a little honey and drinking with meals can be helpful for those with digestive problems. In addition to all its health benefits, vinegar can also be useful around the home for a variety of uses. Because of its antimicrobial properties, vinegar is often touted as one of the best natural cleaning agents. In fact, one study found the key ingredient in vinegar, acetic acid, is lethal to E. coli O157:H7. A combination of vinegar and lemon juice may also be effective against salmonella. Apple cider vinegar is also touted as a key ingredient in an effective natural weed killer formula, a way to neutralize odors in the home, and a key ingredient for a water/vinegar produce bath. For the produce bath, use 10% vinegar to 90% water and briefly swish and soak your produce. However, it is not advised to do this with porous fruits like berries since they can soak up the vinegar and be damaged in the process. Apple Cider Vinegar is also excellent in many recipes, from pickles to salad dressings. Just make sure you find unpasteurized, organic apple cider vinegar for the real health benefits. The darker or murkier the bottom of the bottle is, the better. in Jon's book 'Lessons from the miracle doctors' on page 106/7 he says that malic acid can be used as a low cost chelation alternative, and that malic acid is found in fresh apples and ACV. My question is: do malic acid supplements contain much higher concentrations of malic acid than apples or ACV and therefore would be much more effective? To get enough malic acid from ACV for example would you have to drink pints of the stuff? Yes, malic acid supplements are more concentrated. And yes, you would have to consume several pints of ACV to get a good result. But remember, no one says you have to consume those pints at one sitting. Having small amounts of ACV on a daily basis over several months can be just as effective. As so many foods are pasteurised, is there any way that ACV, sauerkraut etc can be converted to non-pasteurised? Will pasteurised sauerkraut become 'good' if contact with air is permitted over a week or weeks (without going off)? Once something is pasteurized, all beneficial bacteria are killed and there is no way to grow it again. If you try to grow bacteria on your sauerkraut, it could be harmful bacteria, so be careful. Even when making your own sauerkraut, you have to use a 100% sanitized environment to guarantee that you grow the right type of bacteria. That is why raw fermented sauerkraut is found in the refrigerated section of a grocery store. If you have access to raw apple juice, which you can get by juicing apples, you can easily make apple cider vinegar. It takes about 2 to 3 months. Usually, there are enough yeast and bacteria floating around in the air, so you don't need to buy any unless you want to become a connoisseur. Can you specify what the exact amounts would be and the exact mixture with the vinegar as used for cleaning purposes? I love this vinegar and usually have plenty of it on hand. I am exceptionally interested though in the cleaning aspect and results of this product because of the non-toxicity affects and such. I used this type of vinegar, namely Braggs Vinegar - mixed with baking soda to clean my oven and although I didn't really delve into the project as I should have, considering the short amount of time I spent doing so, it gave fairly good results. I would also like to know about killing weeds and I assume it is using the vinegar full strength. Do you think that ACV would be good to help to control lichen sclerosis? And if it isn't , what is? Have you written about this? The cause of lichen sclerosus is unknown but may be the result of an overactive immune system and hormone problems. With that in mind, the following two links may be useful. Does ACV raise or lower urine pH? Because vinegar is acidic, with a low pH, you might think that it would tend to make your body more acidic as well. But that might not necessarily be the case. Remember, citrus fruit, which is also acidic, actually makes the body more alkaline because of the way your body metabolizes it. In any case, a study published in the Journal of Medicinal Food in March 2008 found that people who consume straight vinegar have increases in the acidity of their urine, while those who consume pickles, which contain about half the acetic acid of straight vinegar, experience a slight decrease in the acidity of their urine. The bottom line is that a small amount of apple cider vinegar consumed daily is unlikely to increase acidity levels in your body—and in fact, might even lower them. Consuming large amounts, however, might have the opposite effect. My wife and I ski with friends in their 70's who swear by an energy tonic consisting of ! qt. organic white grape juice, 1 qt. organic apple juice and one cup of organic ACV. They start each day off with an 8 oz. glass. What is your take on all that sugar? It would depend on how much sugar they have during the rest of the day. White grape juice is very high in sugar; apple juice not so much. From the mix you described, you’re probably looking at something over 30 g of sugar per glass. For reference, an oz Coke is double that. In any case, 30 g of easily absorbed sugar in one hit, would definitely provide a bit of a sugar rush. Is it OK to dilute ACV with distilled water & perhaps sweeten with Stevia for lowering blood sugar? Or does it need to be taken straight? I use Bragg's raw ACV. No, you absolutely don’t need to take ACV straight. There is no set recipe, but this should get you started. It’s the recipe Jon Barron recommends when you want to use ACV as a digestive aid. Mix one teaspoon of apple cider vinegar with water and a little honey and drink this with each meal. You may gradually increase the vinegar up to 3-4 tablespoons in water if needed. Very nice article and well written! Good job. Apple cider vinegar is the base for a lot of remedies.